Amazon Smile: Shop with Smile.Amazon.com and The BBC Receives a Donation from Amazon! The BBC has registered with Smile.Amazon.com to allow our members and friends to use Smile.Amazon.com and to designate our organization to receive a donation from Amazon for all purchases made through Smile.Amazon.com. It's easy! Click here for instructions. If you already have an Amazon.com account and have already designated the BBC as the recipient for your donations you can click here to go directly to Smile.Amazon.com. 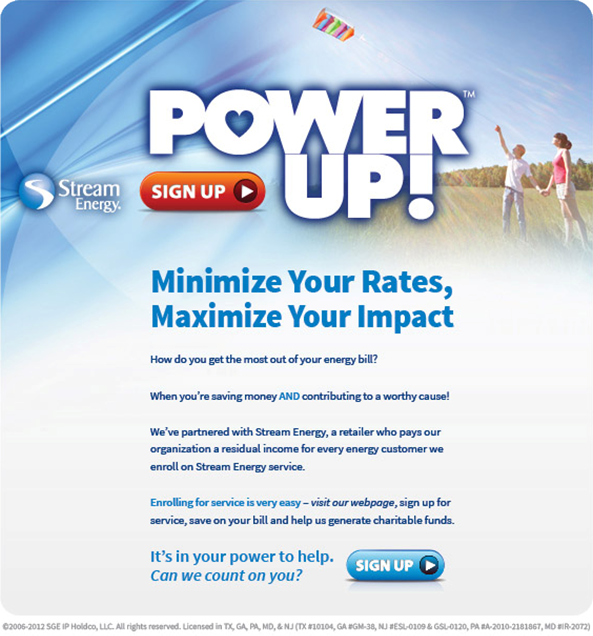 Stream Energy: Switch Your Electricity and/or Natural Gas Supplier! The BBC Fundraising and Sponsorship Committee kindly asks all BBC members to strongly consider changing your electricity and/or natural gas supplier to Stream Energy. You will receive a reduced price on your energy generation (as compared to PSE&G and JCP&L per-KWH and per-therm prices) for a fixed period of time; the BBC will receive a monthly commission for each month in which you participate in the program. You will continue to receive a single bill from your present provider. Switching is easy. Click below to read more information and to get started.